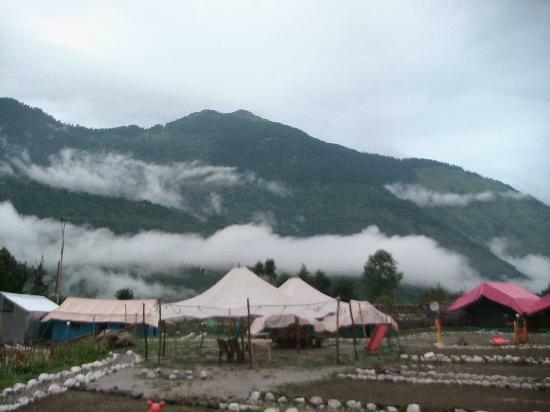 Many of adventure activities and sports like river crossing, trekking, rock climbing, rappelling, paragliding, skiing etc can be done in and around at camp exotica Manali. High level of service delivered at camp exotica. Group can indulge in many of ground sports activities such as volleyball, badminton, cricket, football at camp site. In evening you can enjoy the bonfire with melodious music in quaint environment. Camp Exotica offers 10 Super Luxury Swiss Tents, 8 Luxury Tents and 3 Bamboo Cottages. Indoor Games - Cricket, Volleyball, Chess, Badminton, Carom board. For Corporate Groups:- INR 1750/- per person per night on Triple Sharing. For Couple:- INR 3500/- per night . For College Students:- INR 1100/- per person per night on Quad/Five Sharing. For School Students:- INR 900/- per student per night on Quad/Five Sharing. Complimentary In-house Activities & Games- Volley Ball, Cricket, Badminton, Caram.